Price is per long 32-inch string of these beautiful beads. 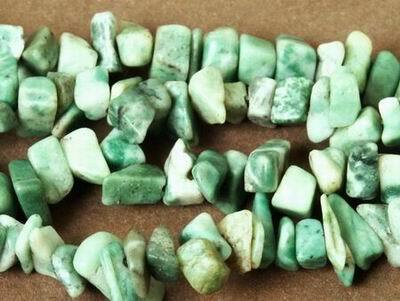 Amazonite is for creativity, and is the childbirth stone. Also called "New Jade". Chip sizes are all different - but average largest is 8mm x 5mm. Spiritualists believe amazonite and aventurine has the ability to purify the spirit and bring balance to male and female energies. Its capacity to calm and bring inner-peace makes aventurine a very important stone in the spiritual realm. Green is the color of healing - with aventurine the all-purpose healer. Not only good for physical disorders, blockages and migraine, but also healing on all levels. Amazonite, sometimes called Amazon Jade, is a similar stone to Aventurine. Usually found in yellow-green to blue-green. Some say Amazonite makes your married life happier.